Not everyone looks forward to washing up by hand after a big family meal. Investing in a dishwasher means your glasses and dishes can be washed more hygienically and, is a great way of helping you to not only save time, but water and energy too. Whether you need a full size, slimline, or integrated model, our dishwasher buying guide will help you decide which dishwasher is best for your everyday needs. One of the first things you need to consider when looking for a new dishwasher, is which type would be best for your dishwashing needs. 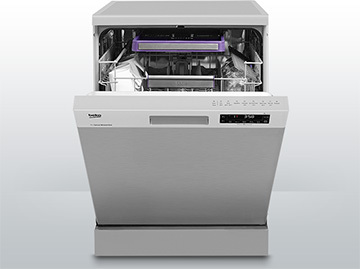 Dishwashers come in three types: full size, slimline, and integrated. When deciding on the type, it’s best to keep in mind which capacity you’ll need at the same time. Dishwasher capacities are measured in place settings, with one place setting commonly consisting of a dinner plate, dessert plate, soup bowl, a glass, a tea cup with its saucer, a variety of cutlery, two serving spoons, a gravy ladle and a medium serving bowl. Being the most common type of dishwasher, a freestanding full size model is ideal for anyone’s everyday dishwashing needs. Their widths measure at 60cm, so they’ll fit into most kitchens easily. Whether you have a big family and need to wash more in one go, or you have a smaller family that entertains regularly, a full size dishwasher offers the ultimate in time-saving and dishwashing flexibility. Our full size models come in place setting capacities of 12 to 15, which means you’ll be able to wash up to 173 items in one go, saving you time and effort. Great for when space in your kitchen is at a premium, a freestanding slimline dishwasher is the perfect solution to your urban life dishwashing needs. The widths of all of our slimline dishwashers’ measure at just 45cm, which means they’ll easily fit into the smaller kitchen of a studio or one bedroom flat. Small on the outside, but big on the inside, all of our slimline dishwashers come with a place setting capacity of 10, which means you’ll still be able to wash up to 118 items in one go. So, being short on space doesn’t mean that you’ll be stuck washing up by hand, thanks to our range of slimline dishwashers. 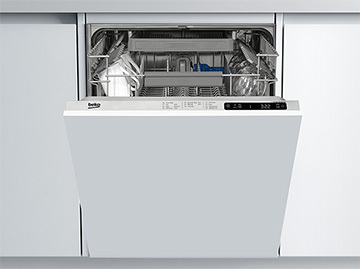 Our dishwasher range offers both full size and slimline models in an integrated installation. Integrated dishwashers are ideal for replacing an old integrated model, or are the perfect addition to a built-in kitchen if you’re planning a redesign. The widths are the same as their freestanding counterparts’. Offering place setting capacities of 10 for integrated slimline models, and 12, 13 or 14 for integrated full size models, we’re certain you’ll find the best integrated dishwasher for your needs in our range. 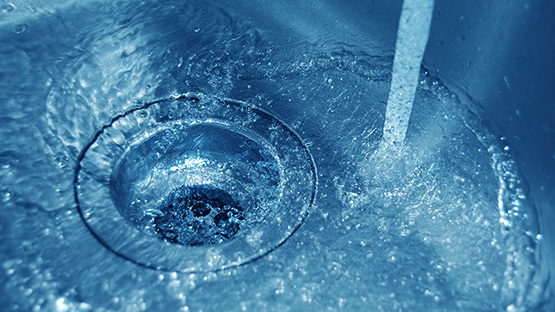 Did you know that dishwashers consume less water than the water you would use if you were to wash up by hand? We’re committed to offering you helpful home appliances that work to keep your energy bills down. So, we’ve developed dishwashers with the lowest water consumption available – consuming as little as 6 litres. Other models in our range use from 9 litres of water, up to 15 litres, which is still less than the water that would be used when washing up by hand. The next thing to consider when buying a dishwasher is which quick programmes it comes with. Quick programmes are a great factor to look out for since they help you wash more in less time, without any compromise on the quality of the wash. Our range offers a variety of quick programmes, helping you save time in your everyday. 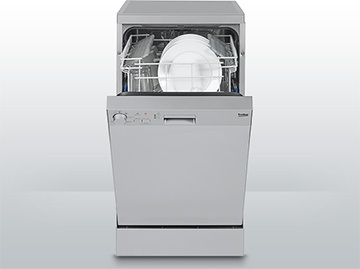 All the dishwashers in our range, whether it be a full size, a slimline, or an integrated model come with our Mini 30’ programme, which can wash a full load of slightly dirty dishes in just 30 minutes. 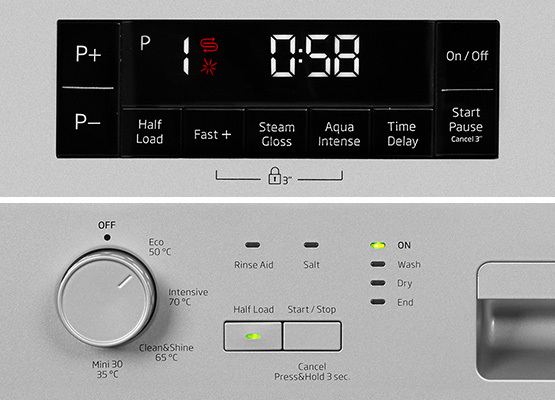 Offering one of the quickest dishwasher programmes available, our Quick&Shine™ programme can wash a full load of dishes, in just 58 minutes. Clean glasses and dishes with a polished finished shouldn’t be too much of an ask. Our Clean&Shine™ programme can clean, dry, and shine even your dirtiest dishes in just 90 minutes. We understand that scrubbing your pots and pans clean can be a chore. That’s why we developed AquaIntense® technology to provide an intensive cleaning zone in the bottom basket. With the help of an extra spray arm, high pressure water is used to clean even your dirtiest dishes, pots and pans, saving you the effort of having to clean them yourself. If you'd rather not spend time cleaning your dishwasher's filter often, our EverClean™ Filter technology keeps it clean four times longer. A special sprinkler system rinses the filter's interior, which not only offers more effective washing, but also helps you save time and effort. If you’re someone who’s particular on how you like your dishwasher loaded, our flexible and adjustable baskets are just for you. From foldable cup and plate racks and a sliding cutlery basket, to upper baskets that can be height adjusted while fully loaded and the option of an additional cutlery tray at the top, our range of dishwashers offers the ultimate in flexible loading to suit your preferences exactly. Now that you have all the information you need to select the perfect dishwasher for your everyday needs, why not start browsing our range of dishwashers? Or, if you want to find out more about what to consider before buying a built-in appliance, head over to our built-in buying guide.